The INTERREG VA Programme is one of 60 similar funding programmes across the European Union that have been designed to help overcome the issues that arise from the existence of a border. These issues range from access to transport, health and social care services, environmental issues and enterprise development. Since 1991 the INTERREG Programme has brought in approximately €1.13 billion into the region. This funding has been used to finance thousands of projects that support strategic cross-border co-operation in order to create a more prosperous and sustainable region. The new programming period for 2014-2020 provides opportunity for continued EU assistance to help create a more prosperous and sustainable cross-border region. In total 85% of the Programme, representing €240m is provided through the European Regional Development Fund (ERDF). The remaining €43m, representing 15% is match-funded by the Irish Government and the Northern Ireland Executive. The content of the new INTERREG VA Programme has been agreed by the Northern Ireland Executive, the Irish Government, the Scottish Government and the European Commission. It has four core objectives where it will make a real and lasting change in terms of Research & Innovation for cross-border enterprise development; Environmental initiatives; Sustainable Transport projects; and Health & Social Care services on a cross-border basis. What is the Co-Innovate Programme? 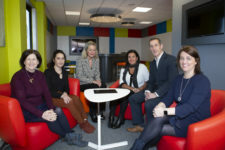 The Co-Innovate Programme is supported by the European Union's INTERREG VA Programme, managed by the Special EU Programmes Body (SEUPB), and was awarded up to €14,702,502.14 European Regional Development Funding in order to support over 1,400 SMEs and micro-businesses in Northern Ireland, the Border Region of Ireland, and Western Scotland. The programme, which is set to target manufacturing and tradable services SMEs with export potential, will provide education and capability support tailored to meet the needs of all participating organisations. It has the primary aim to increase the number of businesses actively participating in cross-border, transnational or interregional research projects and give SMEs and micro-businesses access innovation capability development and help to implement enhanced R&I activity. The programme will result in a transformation of the awareness and performance of innovation activities in the eligible region, in enhanced cross-border linkages, and in strengthened innovation capabilities in SMEs. These benefits will continue well beyond the lifetime of the programme. The programme involves five strands of activity that engage over 1,408 SMEs, providing education and capability development support tailored to their needs and absorptive capacities. The details of the specific support on offer can be viewed in the “Our Support” section of this website. Co-Innovate will complement existing R&I resources in the target area and is focused on the needs of SMEs and developing their capability to use available innovation resources. Who are the Co-Innovate Partners? The Co-Innovate partnership is led by InterTradeIreland and includes Scottish Enterprise, Highlands & Islands Enterprise, Enterprise Northern Ireland, the Local Enterprise Offices in the border counties of Ireland, and East Border Region Ltd. Collectively, the partners have the knowledge, experience and core competences needed to deliver the programme on time and to budget, and their on-the-ground knowledge of what will work best in each respective region will ensure all outputs and impacts set to achieved effectively. InterTradeIreland was established in 1999, and are a non-departmental public Body funded by both governments on the island of Ireland and is charged with responsibility for promoting cross-border business development and cooperation. InterTradeIreland, as lead partner, will oversee the day-to-day implementation and delivery of the entire programme in partnership with the Programme Management Committee. InterTradeIreland has a unique track record in designing, developing, delivering, monitoring and evaluating cross-border R&I programmes for SMEs and as such understands the complexities and the key success factors in delivering cross-border programmes. The organisation has also previously participated on the Programme Management Committees of INTERREG IVA-funded projects. As one of Scotland’s two economic development agencies, Scottish Enterprise is a non-departmental public Body with considerable experience of working with SMEs to help them innovate and improve their competitiveness. Since its establishment in 1991, Scottish Enterprise has a track record of successful engagement in multi-partner projects co-financed by the EU and in applying the learning into useful outputs. Highlands & Islands Enterprise is the Scottish Government’s economic and social development agency for the North and West of Scotland. Established in 1991 as a non-departmental public Body, Highlands & Islands Enterprise has considerable experience of working with SMEs and social enterprises to achieve sustainable economic growth through innovation and competitiveness. The agency has many years of experience in managing large multi-partner EU projects, and of collaborating nationally and internationally. Enterprise Northern Ireland is the umbrella Body for the local enterprise agency network in Northern Ireland. It has vast experience in delivering local, national and international business support services, many of which were co-financed by the EU through the European Regional Development Fund under INTERREG (IIIA and IVA), the Northern Ireland European Social Fund Programme (2007-2013 and 2014-2020) and the EU Programme for Peace and Reconciliation (I and II). Enterprise Northern Ireland is an ISO 9001 QA company and is also IIP accredited. Its legal status is that of a private company limited by guarantee without share capital. The six local enterprise offices (LEOs) operate in the border counties of Ireland. Their remit is to support the development of SMEs at local level. The LEOs have participated in a broad range of cross-border EU-funded programmes over the past 20 years, including the Tradelinks programme. The legal status of each LEO is that of a Statutory Local Authority. East Border Region Ltd has a distinct role in the Co-Innovate Programme to ensure that all expenditure is fully compliant with EU INTERREG Rules and Regulations. East Border Region Ltd’s role is distinct from the role of Project Managers employed by project partners to implement the activities of the Co-Innovate Programme. This approach represents good value for money as East Border Region Ltd is a not-for-profit organisation and has an excellent track record in relation to EU Compliance. East Border Region Ltd was an Implementing Body in the Ireland/Northern Ireland INTERREG IIIA Programme, managing €25m of funding and was Lead Partner on eleven INTERREG IVA projects, valued at €15m.